This trip allows a taste of the Inca Trail without days of hiking and camping and is ideal for trekkers wanting to experience at least a part of the Inca Trail but haven't got the time or energy to complete the full 4 day trek. We begin the hike from the stop’s train at Kilometer 104 and follow the trail for six hours to the spectacular view of Machu Picchu from Inti Punku, The gate of the Sun. From here we descend into the world famous “Lost City”. 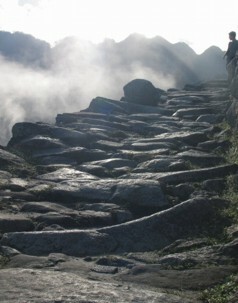 After a restful night in a hotel, We return to Machu Picchu at dawn to see the ruins in perfect morning light. In the afternoon, We return to Cusco by train. The Inca Trail to Machu Picchu 2D/1N is undoubtedly one of the most popular excursions for those seeking adventure and mystery that the Incas have left us. This offer a unique walk, with spectacular landscapes and unforgettable experiences. To all these natural wonders we should add Inca buildings that are worth visiting, the architectural art in perfect harmony with the natural environment. Before taking this tour you must know about the new regulations created to minimize impact on the fragile environment of the Machu Picchu Sanctuary, now days only 500 people in total including guides, cooks and porters on the classic Inca Trail, the shorter Inca Trail and the Salkantay trek 7 days are allow to enter in Machu Picchu though the Inca trail daily. We advise you to book early (at least 90 days in advance is recommended) to secure your spot. Important: Kindly take note that once your spot is reserve and confirmed is non refundable neither allow to do any modifications like names, passport numbers or so. We appreciate your cooperation in this fact as we are also working with the new regulations. This itinerary is rated moderate and should only be undertaken by people who are fairly fit and take regular exercise. 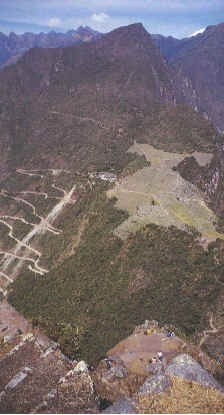 The trek starts at 2100m.a.s.l and climbs to 2700m.a.s.l (Wiñay Wayna) before descending to 2400m (Machu Picchu). Since the trek start at a lower altitude than the Classic 4 day Inca Trail trek, you do not need to worry about acclimatization as much, although many people still find themselves short of breath when arriving at Wiñay Wayna, so this trek should certainly not be considered an easy option. To fully enjoy an Inka Trail adventure, we advise passengers to get into an exercise program for their own safety and enjoyment. If a passenger suffers from any medical condition, we advise him/her to consult a physician about joining an Inka Trail Expedition. We will take our passengers from their hotels at 5:40 pm., after it we will start our journey by train from Cusco. Leaving Cusco at 06:20 am. we will start our hike from km 104 towards Wiñayhuayna(Archaeological Site), in the afternoon, we will take the bus to Aguas Calientes, spending on selected accommodation. The Expedition is a travel experience with all the quality and benefits at a lower cost. Is a service designed for the traveler’s comfort, with four passenger seats located in front of each other, so you can share your experience, and for the faithful backpack that is always with you we offer racks placed above the seats. Also, this train has panoramic windows, air conditioning and heating, and Andean music that creates a cheerful atmosphere. The Vistadome connect your senses through a sophisticated and sensory travel experience; is the ideal train for those who want to be in contact with the environment and appreciate the wonderful journey to Machu Picchu. Surrounded entirely by glass and wagons with large panoramic windows offering incomparable scenic views and innumerous opportunities to capture amazing pictures, Vistadome travelers feel connected and part of the impressive landscape of Peru. Early in the morning, we will take the bus to Machupicchu, guided tour, in the afternoon we will take the train to Cusco, arriving at 7 pm. Approximately. -Train Cusco to Km 104 (Basic Tourist Service-Expedition). 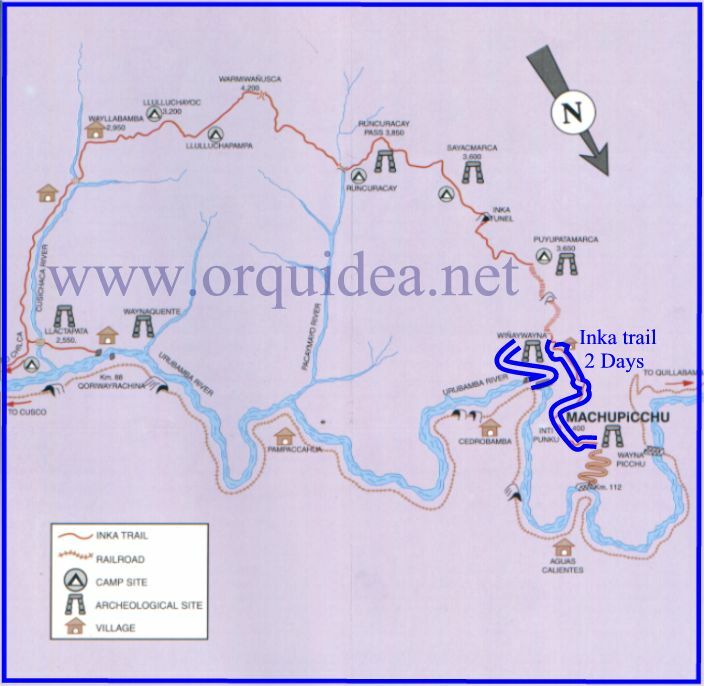 -Entrance Ticket to Inca Trail and Machupicchu. - Fee entrances to the hot springs. - Snacks: biscuits, energy bars, chocolate, etc. NOTE: You will need to leave your extra luggage in the Cusco hotel, all the lodgings in Cusco provide a secure luggage deposit. Put any valuables in their safe box. Importand: We will buy your Inca Trail trek permit using the names & passport numbers that yo will send us with your trek booking application. You must bring these same passports with you to Cusco and take them on the Inca Trail. If the name or number in your passport are different from the name and number on the trek permit, the government authorities will not allow you to start the trek and you will not be entitled to a refund. If you plan to renew your passport between making the trek booking and actually starting the trek YOU WILL MUST bring both passports (New and Old). If you make the trek booking at the student price you must send us a scan copy of your ISIC card at the time you pay the trek deposit. If you fail to bring your ISIC card on the trek the government authorities will not allow you to start the trek. You will not be given the opportunity to pay the extra difference in price! Note: To apply to this discount It is necessary to send us your scan copy ISIC (International Student Identity Card) with your other information. Without this copy we will not be able to make the discount. 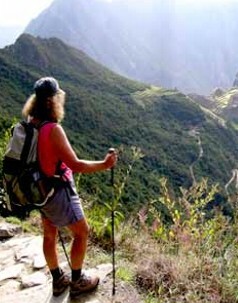 When booking a trek: The government has strictly limited the number of people permitted on the Inca Trail during 2009 (permits are issued to about 200 trekkers per day plus 300 porters). We recommend that you make a trek booking as early as possible. In 2008 the trek permits for some dates sold out more than 4 months in advance!! However don't make a booking until you have all the group details (names, passport numbers, ages etc) and you are sure about your trek departure date since "these details cannot be changed after we have bought your trek permit"
Park authorities may occasionally designate different campsites than those indicate The Inca Trail is part of the Machu Picchu Sanctuary, a protected area of 32,592 hectares. Every visitor must obey park regulations prohibiting littering, cutting or damaging trees, removing or damaging stones of ruins and the Trail, removing plants, killing animals, lighting open fires or camping in the archeological sites (Only authorized campsites can be used). Important Note: We will buy your Inca Trail trek permit using the names & passport numbers that you send us with your trek booking application. 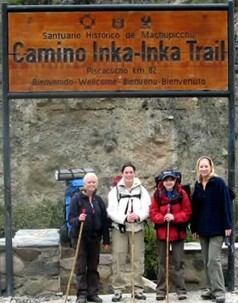 You must bring these same passports with you to Cusco and take them on the Inca Trail. If the name or number in your passport is different from the name and number on the trek permit, the government authorities will not allow you to start the trek and you will not be entitled to a refund. If you plan to renew your passport between making the trek booking and actually starting the trek YOU WILL MUST bring both passports (New and Old). 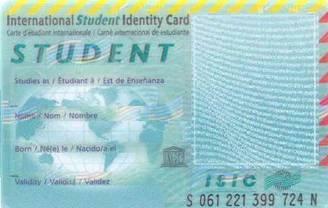 If you make a trek booking at the student price you must send us a copy of your ISIC card at the time you pay the trek deposit. If you fail to bring your ISIC card on the trek the government authorities will not allow you to start the trek. You will not be given the opportunity to pay the extra difference in price!!!!! 1. Personal porters can be hired to help carry your personal items such as clothes, sleeping bag etc. The services of a third of a porter (maximum 9kg or 18lb per person) can be hired for US$135. If you hire the services of a third of a porter (you will need to supply the small padlock). However, even with this service you will still need to take a daypack to carry your essential items such as rain poncho, warm fleece, camera and water bottle. Please note that due to new government regulations the maximum number of porters that we can use in each group has now been capped. This is why we have had to limit the maximum amount of personal equipment that you can give to a porter to carry for you to 7kg or 14lb per person. 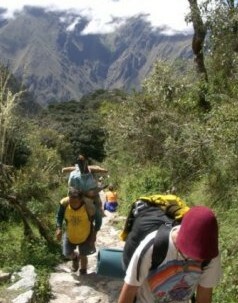 (The maximum amount that each porter can carry on the Inca Trail has also been limited to 20kg or 42lb per porter). Approximately 30% of our clients hire the services of an extra third porter. 2. We can also provide vegetarian meals or cater for special diets at no extra cost but we need to know when you make the trek reservation. 3. You can hire sleeping bags in our office. All sleeping bags are synthetic (easy to wash). They are washed after every use and are guaranteed to be clean. Cost: US$35 per person for the 4 day/3 night trek. Weight 2.5 kg and are rated to 12 degrees below freezing (nice and warm even during the coldest of nights experienced on the Inca Trail). If you will take any trek with us. we ask you to fill the customer chart regarding the commentaries or otherwise you can inform to the Operations Department. This is a very important requirement and necessary to do after take the tour to avoid problems regarding the quality of the service and help you to resolve it before you leave to your country otherwise our agency is assuming that all your services was ok therefore we are not going to accept any claims.